By virtue of its clogginess, the human gut, particularly the small intestine, is difficult to examine and diagnose for potential diseases or afflictions. Irritable bowel syndrome, coeliac disease and Crohn’s disease are just a few of the most common diseases that affect the small intestine and can lead to severe complications. In fact, some 35,000 deaths occurred in 2010 as a result of inflammatory bowel disease. University at Buffalo in the US have developed what they call a ‘nanojuice’ that can effectively image the small intestine and its surroundings in real time, something that wasn’t possible until now. Typically, when you have your bowls thoroughly examined by a physician, you’ll be asked to drink a thick (somewhat disgusting) liquid called barium. A combination of X-rays, ultrasound imaging and magnetic resonance then work together to paint of picture of what’s going in inside. The results aren’t that great though. For one, the quality of the image itself isn’t quite the best, hindering accurate diagnosis. It’s not all that safe either. Worst of all, however, you can’t image the small intestine in real-time using this technique, so you can’t see muscle contract and so on – the kind of information doctors often have to fill out by imagining. The nanojuice is filled with nanoparticles designed to bind to the inner walls of the small intestine. Once it’s ingested (there’s no word of how fowl or pleasant the concoction is), the juice reacts with the light fired by a harmless laser into the patient’s bowls. 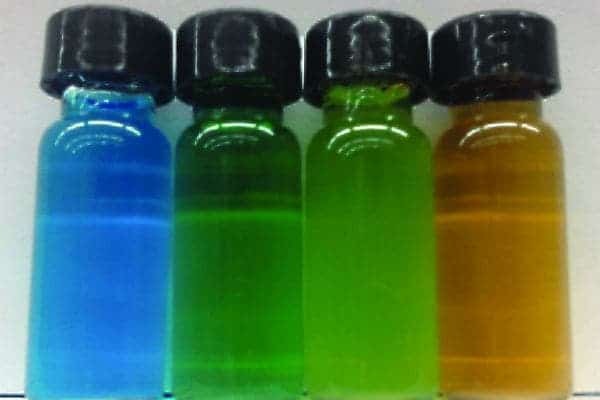 Dye molecules called naphthalocyanines, packed inside the juice in special nanoparticles called ‘nanonaps’, absorb the infrared light from the laser. A computer processes the images and offers a clear, non-invasive and real-time look into the working organ. The team reports its work in the journal Nanotechnology.